Microsoft says that USB peripherals won't be supported by the simulated Xbox 360 at the heart of the new Xbox One technology. Well, we know which games Microsoft won’t be bringing to the Xbox One as part of its new backward-compatibility with the Xbox 360: anything that needs Microsoft Kinect. So no, you won’t be playing any of the Dance Central games. Sorry, Kinectimals. Kinect Sports? Nope. Kinect Party, you can go home now. All told, Wikipedia lists over 60 Xbox 360 games that require the Kinect, and all of them won’t be supported by the new update. No, Microsoft doesn’t have it in for its old depth sensor. Instead, the reason is more mundane. Microsoft essentially simulated an entire Xbox 360 in software to allow the One to become backward-compatible with its older console, with one exception: USB ports. That means the simulated console can’t access external peripherals or storage, and it won’t be able to connect to USB peripherals like the Kinect—even, apparently, if the One owner has a newer Kinect attached to his or her system. The Xbox 360 dashboard in the Xbox One. “What we’ve done to make this happen—which we didn’t think was initially possible—was we built a virtual 360 entirely in software—and we take the old 360 games and put them in the emulator and we put them in emulation,” Bill Stillwell, from the Xbox Platform team, explained in a livestream Monday night. 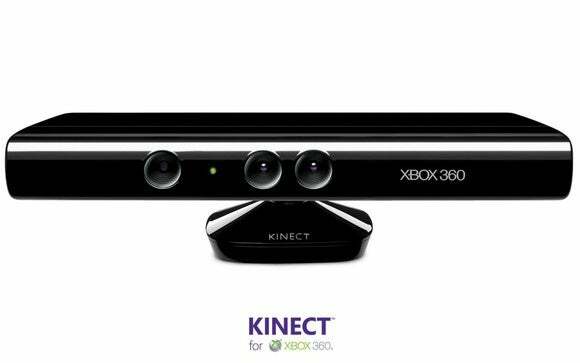 Still, Microsoft has shown little love to its Kinect depth camera since the peripheral was launched as one of the flagship features of the Xbox 360, with the ability to recognize not only your movements, but you—loading all your games and preferences at your command. A year ago, Microsoft unceremoniously dumped its next-generation Kinect camera from the Xbox One—and set the stage for consumers to wonder whether Microsoft had wandered astray. Why this matters: Somewhat ironically, gamers may leave E3 actually pining for Kinect—because an upcoming update to the Xbox One will add Cortana, Microsoft’s digital assistant. Caught up in a firefight or a raid or a game-winning drive, gamers may not want to pause and search for a friend online. Instead, vocally ordering Cortana to do so may become a better choice. Will those gamers need Kinect, though, or will they be able to trigger Cortana over chat? Microsoft hasn’t said. 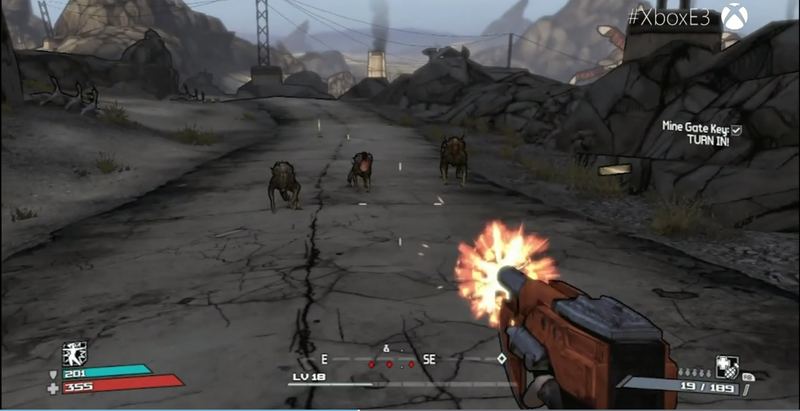 Borderlands, an Xbox 360 game, running on an Xbox One. Users will have access to all the Achievements, Friends, and matchmaking capabilities that they normally would on their 360, Stilwell explained—in addition to all the Xbox One’s features. You can order your Xbox One to take a screenshot and upload it to impress your friends—something your 360 can’t do. Users can dust off their Xbox 360 games that have been saved to the cloud as well as any Achievements they earned while on the older console, Stilwell explained. If you own an Xbox 360 digital title, they’ll automatically show up in your One library, Stillwell explained. 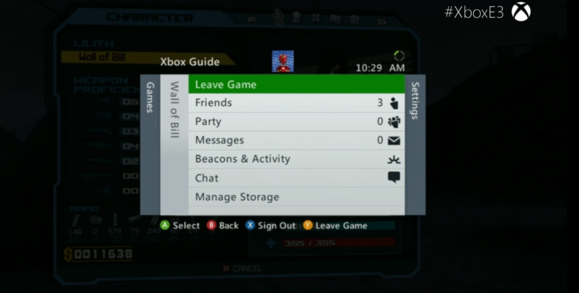 You’ll need to insert your Xbox 360 game discs into the One, where the game will “download” to the One. (Stillwell seemed to imply that you’ll need to leave your disc inserted for verification purposes, too.) That assumes that either the digital or disc title is among those that Microsoft will support, which will include all first-party Microsoft titles as well as popular Xbox 360 games. Microsoft knows which games are being played the most on the 360, but will also factor in community input (read: loud complaining). As Microsoft executives explained earlier today, the company is launching backward-compatibility together with a limited number of titles to Xbox Preview members. The backward-compatibility feature will roll out in the fall with over 100 titles supported, Stillwell said. According to Stilwell, the only obstacles to adding a title to the program are legal ones, not technical obstacles. “Really, the only thing that stops us is getting the legal permissions for licenses that changed over time, or whatever the case may be,” Stillwell said.